I love Susan Straight. She is California born and raised, literary, a creative writing professor at UC Riverside and she straddles cultures. Her novels deal with the ethnic mix of her particular home turf in Riverside. She writes about families, mothers, kids and how they protect each other in the dangerous racial climate of 21st century America. She is a master novelist and I cannot imagine why she has not won a Pulitzer or National Book Award. I had read seven of her eight novels. Back at the end of 2010, I binge-read four of them in a row and came away feeling I had been to a sort of literary religious revival. Those three were Blacker Than A Thousand Midnights, The Gettin Place, A Million Nightingales, and Take One Candle Light A Room. 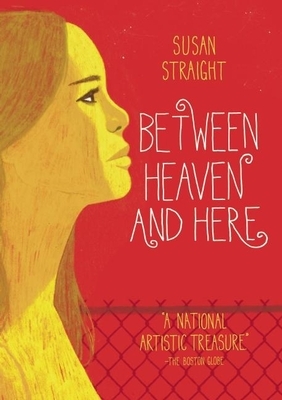 In 2012 she published Between Heaven and Here. I bought it right away but ended up hoarding it until I was pretty sure another book was on the horizon. I found an interview from 2016 where she said she was finishing a novel so I took the plunge. I made Between Heaven and Here the July selection for my 2018 Read 12 Books From My TBR Lists project. This short, rich, searing novel takes place in time between A Million Nightingales and Take One Candle Light A Room. The three books form a trilogy. Glorette, the most beautiful yet most damaged daughter of the extended family who people the three novels, has been found dead in a shopping cart. It is August, the ground is too hard and dry for digging a grave. If the police are brought in her memory will be made ugly and her son Victor will be too traumatized, not to mention probably becoming Social Services bait. So the body is brought to the family compound in the orange groves. Victor is found and brought to his grandparents. Glorette's uncle Enrique goes in search of the killer. Out come the pickaxes, the shovels and the soaking hose to soften the ground. A grave is prepared. Perhaps because the two earlier novels softened the hard dry hearts of her readers, we who think we have read it all, the succinct power of these 234 pages is all the stronger. When a troubled member of a large family dies, there are many viewpoints on the tragedy, varied reactions and anxieties. One whom the family has failed to protect has gone down. In flashes of incident, in memories, in the poetry of emotion, Glorette's short life is drawn for us. I love Susan Straight even more now and if that new novel doesn't come soon, I may just have to go back and read the first eight books again. Wow, sounds like Susan Straight is a powerful writer. I've not heard of her before. Nice review! Thank you Lisa! She is a California treasure, as far as I am concerned. I hope Susan Straight publishes a new novel soon, for your sake and pleasure. ;-) I'm glad that you found this one as powerful reading as all the prior ones you have read penned by her. I am waiting, impatiently, for the new one! Once again a writer whom I haven't met before. I just googled her and found that she has had quite an illustrious career, including being a finalist for the National Book Award in 2001. Your review convinces me that I should make her acquaintance. I was hoping you would feel that way. I think you will get along quite well! Most of them do. I read somewhere that her new one is set in Holland where her ancestors came from.